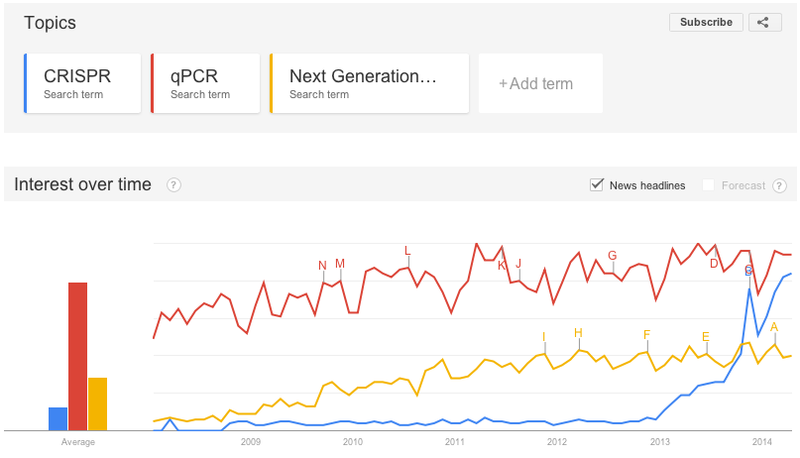 What’s Trending in the Molecular Biology World? CRISPR !!! You are here: Home / Headlines / Gene Expression - Molecular Biology / What’s Trending in the Molecular Biology World? CRISPR !!! It’s official, CRISPR has officially reached “Breakout” status as a Google search term (see image from Google Trends). The Clustered, Regularly Interspaced, Short Palindromic Repeats (CRISPR) and RNA-guided Cas9 nucleases are an exciting new gene editing tool that allows life science researchers to directly modify the DNA of the organism they study. In short, CRISPR promises to allow scientists to really cut the chromosomal DNA of their organism of interest at a precise position and add or delete whatever sequence of DNA they wish by using small base pairing guide RNAs (sgRNAs) that direct the nuclease to a specific sequence in the host DNA. So what kind of scientists are interested in using this CRISPR technology and where do we see the most potential? 1) Labs and platforms charged with making knock-out and knock-in mice are seeing CRISPR as a more powerful, precise and targeted way of modifying embryonic stem cells used in this process. Wang et al. (Cell 153, 910–918 (2013)) demonstrated that CRISPR-Cas9 could be used to generate mice with multiple mutations in multiple genes, which was not possible with previous technologies. 2) Pharmaceutical company researchers wishing to test the effect of a mutation on a disease phenotype in human cells. With CRISPR technology the mutation of genes will be greatly facilitated allowing, for example, neuroscientists to test the effect of a mutation in human neurons on a disease phenotype. Previously, researchers were faced with the issue of having to collect fibroblasts from patients carrying a specific mutation, generating induced pluripotent stem cells (iPSCs), and then differentiating the stem cells into the disease-relevant cell type. 3) Basic science researchers or translational research scientists wishing to establish isogenic cell lines with their gene of interest knocked out or mutated. The CRISPR technique will also be quite powerful when working with primary cells, since knockout completely blocks gene expression while siRNA knockdown only gives partial suppression. 4) Researchers screening for new genes involved in a physiological process. For example, using a CRISPR library pool of 73,000 sgRNAs targeting human genes, Wang et al. (Science 343, 80–84 (2014)) were able to perform a negative selection screen to identify new genes involved in DNA damage response. …and how are scientists accessing this technology? Does one have to be an expert molecular biologist to start using CRISPR? Molecular biologists are excited about this technology, since it will allow them to dig into their genome browsers like only they can, but there are other options for the rest of us. The experienced CRISPR designer likely will only need a good supply of high quality sgRNA from suppliers like TriLink Biotechnologies. TriLink’s OligoBuilder® can be used to design sgRNA. Complete CRISPR design, validation, and even stable cell line generation are possible from companies offering expertise in this technology. To have an idea of the full range of these offers see tebu-bio’s CRISPR page and contact the technical specialists. Szczelkun et al. (‘Direct observation of R-loop formation by single RNA-guided Cas9 and Cascade effector complexes’, PNAS – May 2014) bring extra information regarding recognition process and specificity of the CRISPR-Cas systems.